I’ve been looking for something with this fun saying on it for a while. I haven’t had any luck finding anything though. So, that meant it was time to make my own. 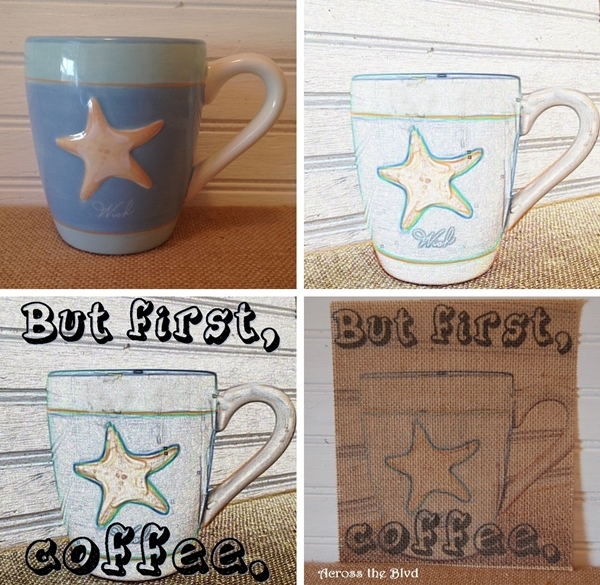 I wanted it to fit in with my coastal decor in my kitchen, so I pulled out a starfish coffee cup to help me. A little while I go I bought two wooden plaques at Goodwill for .25 each. The pictures on them are not my style at all, but I knew that a little paint could fix that. 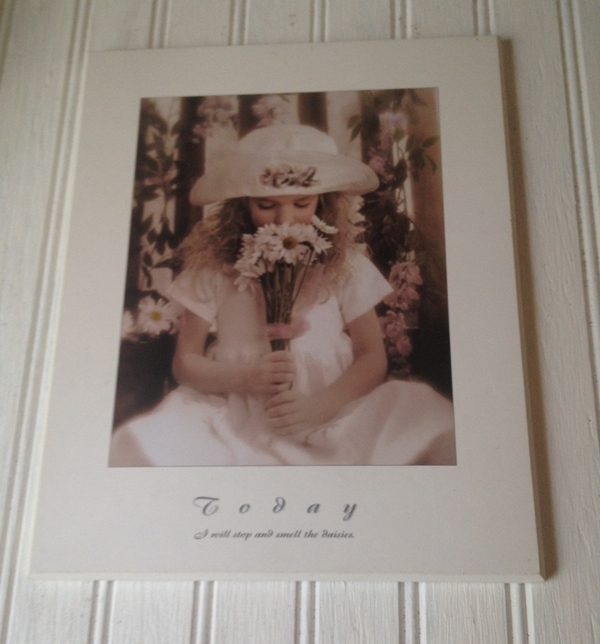 I gave it two coats of chalk paint to fully cover the picture. I cut a piece of card stock to the size I wanted and used spray adhesive to glue it to the plaque for backing for the print. The fun part of this project was figuring out how I was going to get the image of the coffee cup to print well on laminated burlap. I took a picture of the cup using a plank board behind it and a burlap covered board beneath it. After resizing it to the dimensions I wanted, I used the colored pencil feature in PhotoScape. (PhotoScape is a great free photo editing program by the way.) I knew it needed to be much darker to show up nicely on burlap, so I used the color enhance effect and then I darkened it a few times. I found a font that I thought looked fun (Tequilla Sunrise) and added the text over the picture. It took a couple of test prints to get it to the tone I wanted. 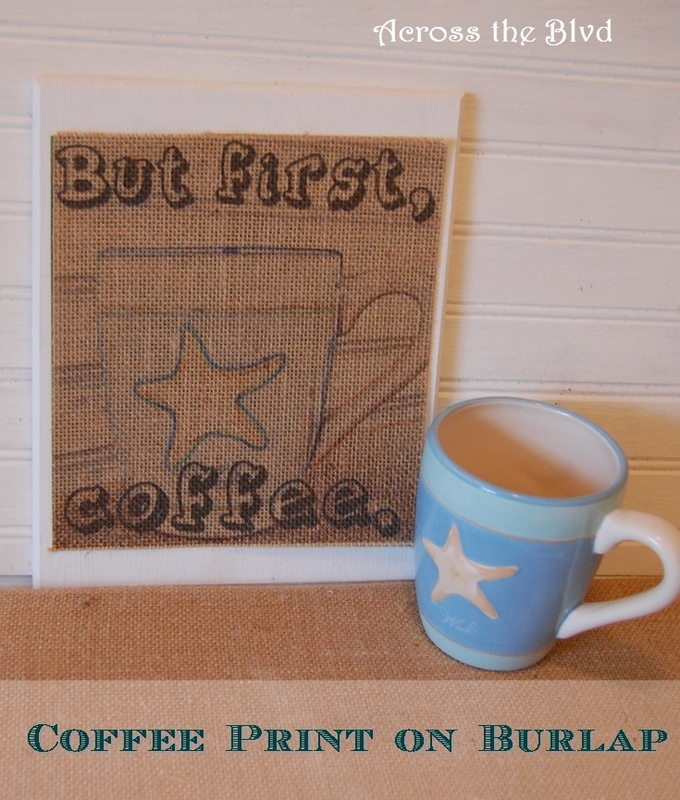 Using laminated burlap sheets makes printing on burlap super easy. I used more spray adhesive to attach the print to the card stock. 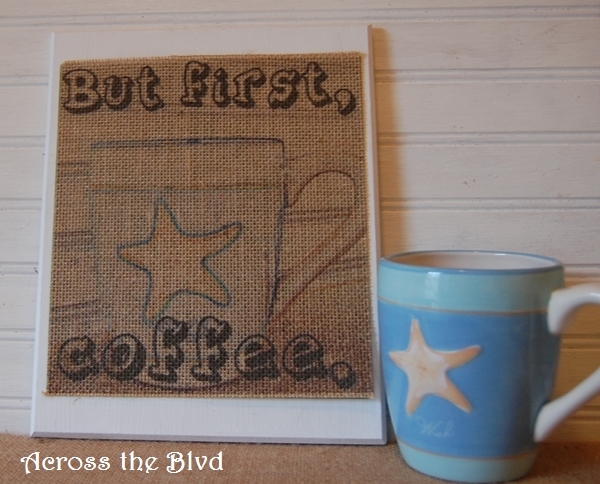 I think it’s a fun little piece of wall art and I really love that I could incorporate my star fish cup into it. It fits nicely on one of the narrow walls near my coffee maker. Anyone who knows me, will tell you that this saying is an absolute truth in my house! When you can’t find what you’re looking for, you can almost always find a way to DIY! How fun is this??! 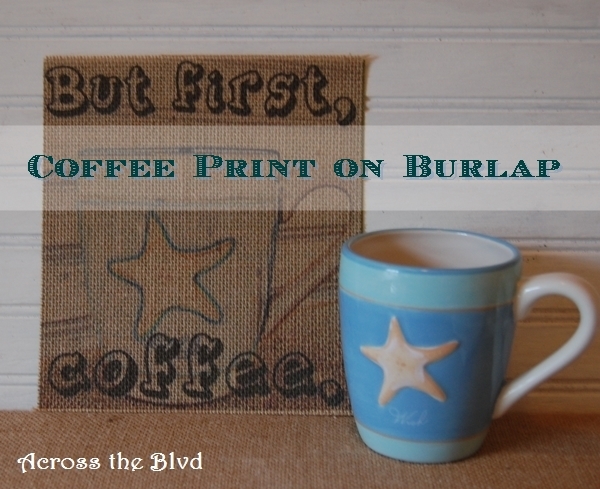 I was so interested in how you were able to get the mug to print on the burlap! What a great project and of course it has my mind spinning on all the possibilities! Thanks! It was a fun project to put together and once I decided on how it could be done, it was an easy one, too! 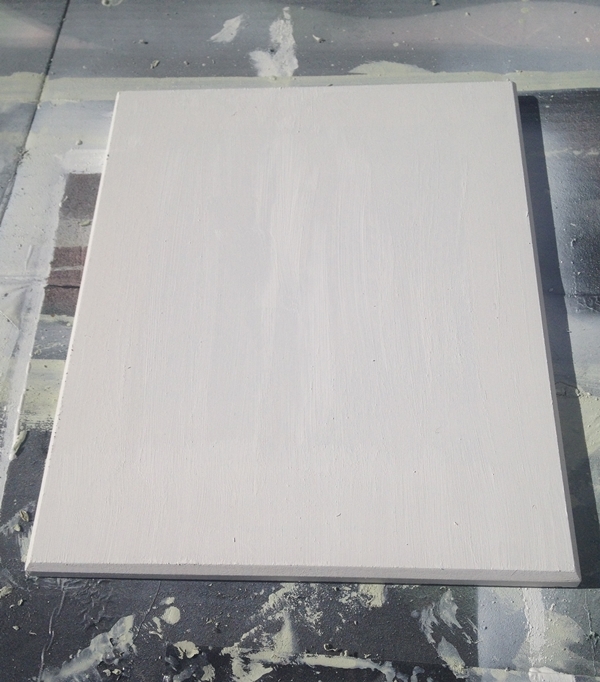 Beverly – this turned out great! I’ve never heard of laminated burlap sheets – such a wonderful idea! Love your creativity and imagination – as a fellow coffee lover, this is perfect! Happy Mother’s Day and cheers to a great weekend! Thank you! I discovered those laminated burlap sheets last fall and fell in love with them. They are so easy to use. Thanks for the Mother’s Day wishes. I had a lovely day. I hope you did as well. “When you can’t find what you’re looking for….” -ha, loving it! It’s true, isn’t it? Thanks for stopping by, Mila! Popping over from Totally Terrific Tuesday =) I too love that saying! I plan on making my own as well. This was so cute I tweeted it =) Be sure to share your recipes, crafts, upcycles & DIYs at Two Uses Tuesday (Mon 8pm EST to Fri 11pm EST) over at Sarah Celebrates if you don’t already! Thanks so much, Sarah. It’s a fun saying and so true! Thanks for tweeting it! Laminated burlap? Where would I find that? Love the idea!!! Thanks! I first found it at Walmart. It’s from Creative Essentials. I’ve seen it at a couple of other stores, but the best price I’ve seen is at Walmart. It’s $2.99 for three sheets. It works great and goes through my printer just like paper. You are so creative, Beverly! This is such a unique project! Thanks so much, Megin! Happy to share on Brag About It! What a great idea and I love the saying! Thanks for sharing at What’d You Do This Weekend?! Thank you, Joy! It is a great saying for morning coffee lovers! I’m happy to share on What’d You Do This Weekend. Thank you, Dee. My printer is nothing special. That’s the great thing about these laminated burlap sheets-they will feed right through a printer just like paper. Hope you have a great weekend. Beverly, you are sending a good message there. It looks so good when it is finished and framed. Thanks, Kathleen! I do love my coffee! Thank you! I went through a few trials and errors for this one, but I was happy with how it turned out! This is such a great craft project! So cool! 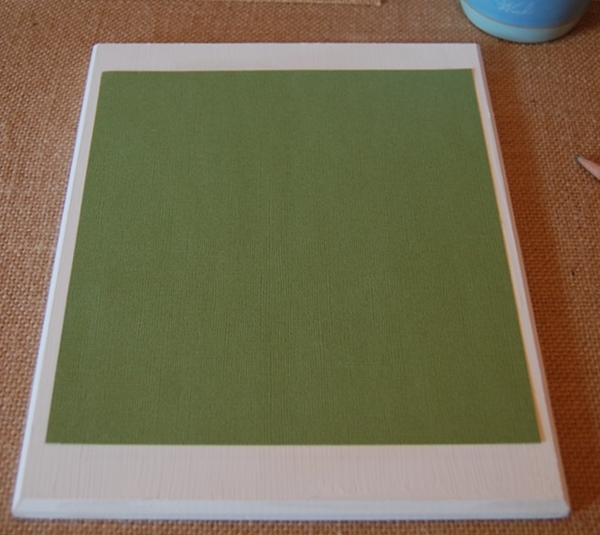 The end results look stunning and blends in well with your decor! 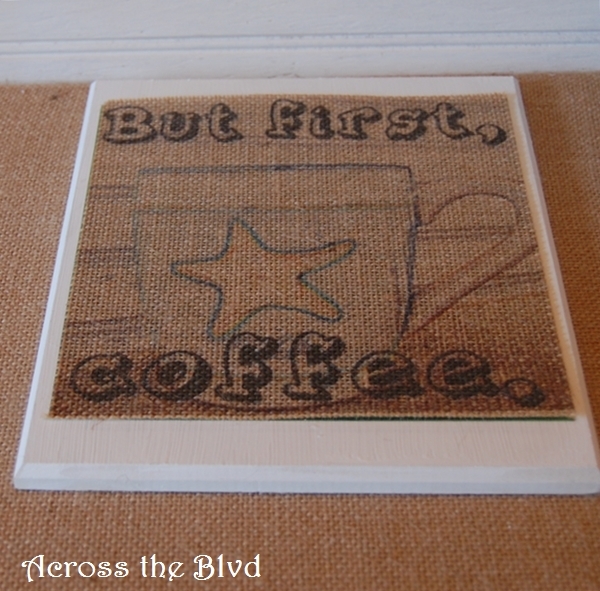 I like using laminated burlap since it’s much easier to manipulate and you don’t have to worry about it fraying. Thanks so much, Gail! 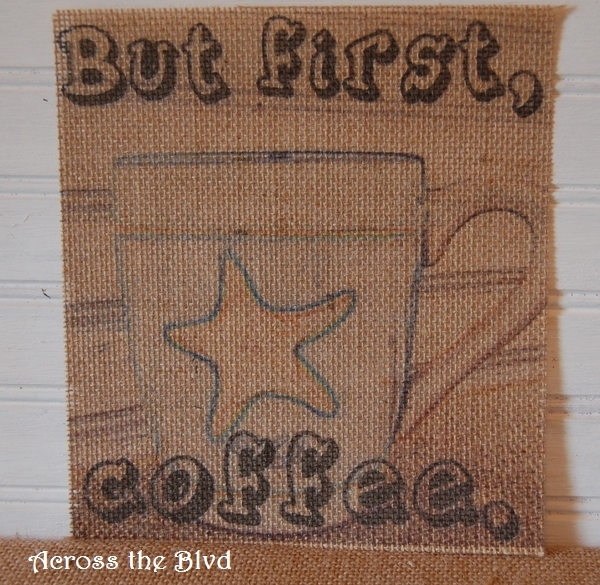 I love using laminated burlap, too. It makes printing projects so easy. Thanks, Wendy. I’ll be happy to answer any questions if you make one. Thanks! It’s so great to use, Darlene. I’ve found the best price for it at Walmart. They now have it in an off white color, too. This is super cool! 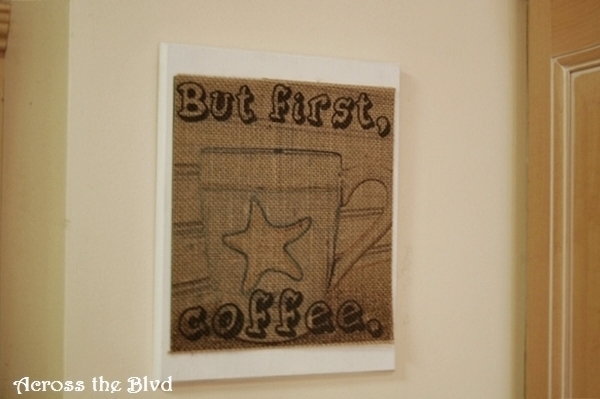 I love how you figured out how to transfer the picture onto the burlap! Thanks, Sherry! It was a bit of a challenge, but it worked out well.